Just a day after there were reports that Samsung will launch its Z1 smartphone in India this week, the device has been launched with a price tag of INR 5,700 ($92). 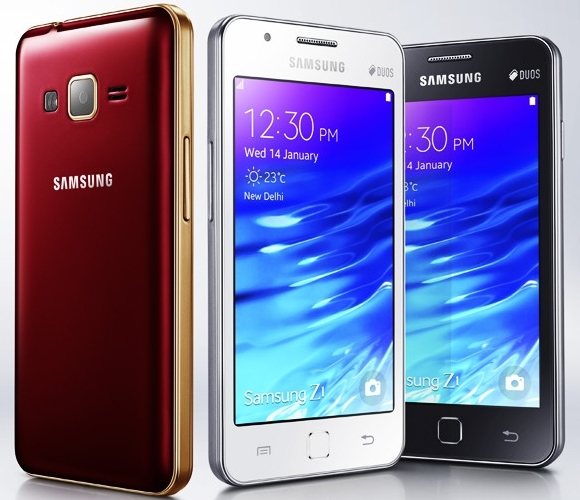 It is the company’s first Tizen OS-based smartphone in the country, and is available in White, Black, and Wine Red colour options. The Samsung Z1 is powered by a Spreadtrum SC7727S chipset containing 1.2 GHz dual-core processor and Mali 400 GPU. The smartphone sports a 4-inch WVGA display, and runs Tizen OS 2.3. The budget-minded Z1 comes with 768MB of RAM and 4GB of internal memory (expandable up to 64GB via microSD). It has a 3.1-megapixel rear camera and a VGA front-facing snaper, and packs in a 1500mAh battery. Other features include dual SIM support, as well as Bluetooth, Wi-Fi, GPS, and 3G connectivity. On the software side, the smartphone features built-in AntiVirus protection, an Ultra Power Saving Mode to extend the battery life, and free access to Hungama music for three months, as well as premium content though Club Samsung. It also lets you send SOS alerts, something which can be done by pressing the power button four times. Reliance and Aircel users will also get 500MB of free 3G data per month for a period of 6 months with the device. Tizen is limiting.The tizen store has limkted apps.I give it 1star.I cant access even my local apps.